Every combination of these phrases plus many, many more are things that I have repeatedly heard since moving to Morocco. They’re also commonly heard in the tourism industry. I decided to write this post in hopes that people who are visiting might understand what is the actual cost of things in Morocco. Nine out of ten times there is a huge discrepancy between what things cost and what people think they cost. Don’t get me wrong, there are still deals to be had however Morocco today is not how it was ten years ago – or even five years ago. Many people have told me they expected Morocco to be priced similar to southeast Asia – this is very far from the truth. Prices in Morocco are very similar to what you would pay in many parts of Europe (especially southern Europe). In fact I’ve found eastern Europe is actually quite a bit less expensive than Morocco. The price of living here has gone up and the price of doing business has gone up in a huge way. Note these are in Marrakech, other cities may vary slightly. Rural areas will likely be considerably less. I am giving prices in US dollars as it is an easy to understand measure. Why you’re asking do I give two prices for guided tours. If you would like to take the cheaper option I can’t almost guarantee you will spend a large chunk of your time shopping – whether you want to or not. Guides make their money through commission. There’s nothing wrong with this per say but if you’d rather do something else, pay for a better guide who will respect your wishes. It’s worth it – trust me. Just as a general figure the average salary for Moroccans in Morocco is about $10,000 A YEAR. I estimated the other salaries as they depend on level of service, time in position, and any additional work done outside the regular office job. For many expats living in Morocco salary can vary drastically. Does this mean you shouldn’t come? No, you absolutely should come and visit – but be prepared for the reality of what things cost. Don’t expect a 5 star experience for a 2 star price tag. I’ve found it’s really helpful when people have a realistic understanding before arriving. This is also good to keep in mind when you find yourself negotiating the price of things. For example that $50 handmade leather backpack? A leather craftsmen can make 3 or 4 a day tops. His costs are immediately used up when he purchases the materials to make the bag. While a few dollars won’t make a big deal to you, it will to him. A few dollars can pay for a meal, or pay the school fees for his kids. Really consider this when you’re purchasing things. There are still deals to be found in Morocco! Check out my guide to seeing Marrakech on a budget and cheap meals to eat in Morocco for some ideas. Did any of these prices surprise you? Don't Lose Your Shirt Haggling! SECRET SHOPPING TIPS FOR MOROCCO! 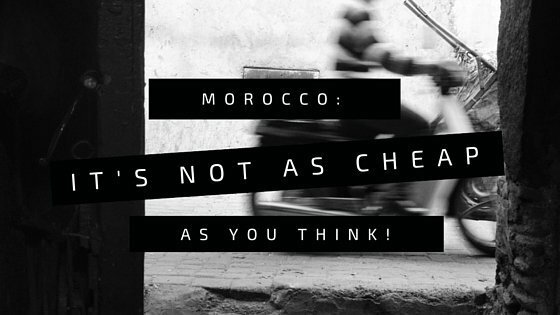 Even if you've never bargained before and have no idea what to expect when shopping in Morocco - I can help! 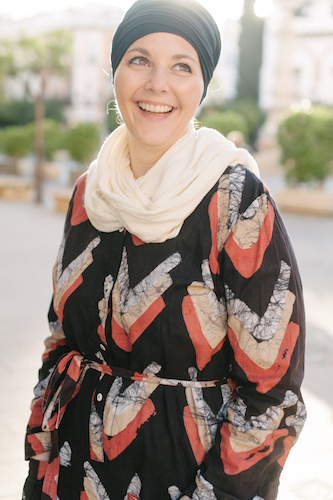 Get my FREE email course with secret tips for shopping in Morocco PLUS a downloadable copy of my guide to buying souvenirs + how much you should pay. I want to learn all the shopping secrets! Wow. It is super expensive there! I always hear it is cheap. Can you work on a residency permit? With such high wages, seems like getting a local job is the way to go. And since there are basically no requirements to get a residency permit, right? You can work on a residency permit but the wages really aren’t that high depending on what you’re doing or how you’re earning. There are quite a few requirements for a residency permit and it can be confusing and frustrating. I am planning on visiting Morocco and do you have any suggestions on what would be the perfect gifts /souvenirs to bring back from Morocco? Thank you! I don’t think there’s any one time that is cheaper than another. I’d suggest just putting up a flight tracker to watch for sales. It also can be cheaper to fly to Europe and then take a low cost airline like EasyJet or Ryanair into Morocco, a little more hassle but can save a lot of money. Hi Amanda and thanks you for taking time to write that information for all future tourist like me. So what we need is to buy decent lunch and have enough to buy souvenirs, spices, you know somethings to remeber our journey. You can not exchange for Moroccan money outside of Morocco. My understanding is it is possible in a handful of places outside the country but the Moroccan currency is closed. This is also why you shouldn’t bring any out of Morocco in hopes of exchanging it when you’re home – it’s not possible. I also don’t think 2000 dirham will cover that for a week unless you plan to do things very frugally. I would just plan to bring cash to exchange on arrival and use the ATM when you arrive to take money out. Im curious about buying spices from Marocco. Is the Marrakesh market place to go? Any idea what would be good price for example black pepper, curcumin, gimger. Any other suggestiob where to go for good spice shopping? You’ll be able to find good spices anywhere in the country. I’d actually stick to buying them in small shops where locals go as opposed to “spice shops” which really are just for tourists and don’t have anything to do with quality – plus they’re overpriced! Nice article, Amanda! I was enlightened. It won’t be like travelling to India or Vietnam – but there are ways to save a lot still while travelling. They just have to compromise a little on things like accommodation and choice of transport. Is it true you can buy a really nice home for 20k there? Depends where you want to live and what kind of house you want to buy. Wait… can foreigners own a house there in Morocco???? Legally? Yes…the only thing they can not purchase is agricultural land and a few other restrictions. I’m currently looking for someone to lighten me up and inform me roughly about my plan of renewing my wedding vow in morocco. I came across ur blog which I think is very informative and helpful so I would like to ask for ur suggestion and tips. I would like to organize in Marrakech a Moroccan Berber theme party to celebrate our 10yr wedding anniversary. How much budget do I need for 30-50 pax including venue, decoration, caterer? Thank you in advance for ur help! I wish I could give you a really good idea on this but so much will vary on which city, the type of venue etc. I guess I would estimate $10,000 US as a base price. But again there are so many variables that it’s impossible for me to even give a good answer. I think not quite as expensive as Dubai and you can live here much cheaper if you choose. But for a western style of life it is more expensive. All that said, the wages are very low for labor. From everything I have read it is no where as expensive as Dubai. Renting an Apartment there can run you $1500 for an efficiency. When I lived there my home was $30,000 a year. that was several years ago. I can only imagine what its like now. Im looking forward to going to morocco and living on a normal budget. Hello, thanks for the post. I am just leaving Morocco after a wild week here and wanted to ask only why there is no processed milk products like cheese and youghurt prodused in the country. I mean you have tradition in farming animals but it seems you only have the meat and the leather and milk is rarely used. Or I am wrong? There’s a lot of yogurt produced here (and milk) but it’s not really a bit part of the diet – except for yogurt. It also depends where you go. In northern Morocco there’s much more than the south. Part of that is that it’s a very hot climate with limited traditional means of refrigeration. I am enjoying reading your blogs.I am visiting Morocco in a weeks time.I am a single female that will be travelling as part of a group tour. There are however a day or 2 where we are given free time in Marakesh and Casablanca. Is there link where I can maybe meet up or chat to local females just to learn more bout the culture/country so on those days I would not be alone? I would prefer an email response.Thank you. I’m afraid I don’t know of specific websites to meet other female travelers in Morocco but if anyone else has suggestions please do leave comments! I’m also single and visiting Morocco within a week with a tour group that I will meet in Casablanca. How did it go for you? Any advice on anything in particular? Just curious. Thank you. Just one thing the drivers usually wait outside of the airport on arrival at casablanca. ..I had a bit of trouble finding the person initially. Also there is a train from the airport into the city if needed. Hi Amanda! This is a brilliant post! Thanks for all these information. My husband and I will be going to Morocco in June with our baby. It will be the ramadhan period. Any tips for travelling with babies? Is it advisable to go on the camel ride with our baby? He is 1 year old. Also, are baby items like milk and diapers also expensive in Morocco? Hi – If you’re asking about going to the Sahara with a baby, I would say it isn’t a great idea. It’s going to be very hot and uncomfortable. You won’t find car seats and if you bring a stroller stick with a small one. You’ll find baby things just about everywhere and they’re not expensive. Likely the same as you’d pay at home, maybe even a little less. My husband is traveling there on business. He asked what souvenir I’d like him to bring me. I’d like a pouf. How much should he expect to spend on a good quality one? Depends how good he is at bargaining 😉 For a normal size one expect to pay about 400-500 dirham. I love this post, it is definitely ,much of a help for new visitors! We are visiting Ait Ben Haddou today and leaving back for Marrakesh. Can you please advise if buying carpet (hand woven dhuri style) is cheaper in Ait Be Haddou or in Marrakesh? Hi! I would say Marrakech will give you more selection and flexibility BUT if you see something you love in Ait Ben Haddou, like I did – get it – don’t wait! Im all mixed up! I’m planning my trip to Marrakech in January and I am looking at a bus ride from Marrakech to Essaouira. I use a devise converter on the web and it says that a bus ride would cost 9$ (Canadian) that’s very cheap… The ride is 70 dirham. Am I not converting correctly? If I put 70,00 dirham, like I see on the buss web site, it converts to 900$. So now this is impossible, for a bus ride of less than 2 hours.. Is it cheap? Or very expensive? Hi Stephanie – I think I emailed you the answer but in case someone else is reading the $7-8 fare is correct. I was warned about the rising costs in Morocco, but when I finally went there, I was indeed really shocked at just how expensive things really are. I live in Los Angeles and many products in Morocco were more expensive than in L.A. The cleaning supplies, kitchenware, furniture, even simple plastic things for the house were all much more expensive. The costs vary at such extremes. I went to some cafés where oulmés was 5 dh and places where it was 35 dh. Some things were very reasonable, but some products were way overpriced. Deodorant (a conventional brand) was like 45 dh and makeup was ridiculously expensive. I found ways to find reasonable prices, thanks to my boyfriend for helping me. 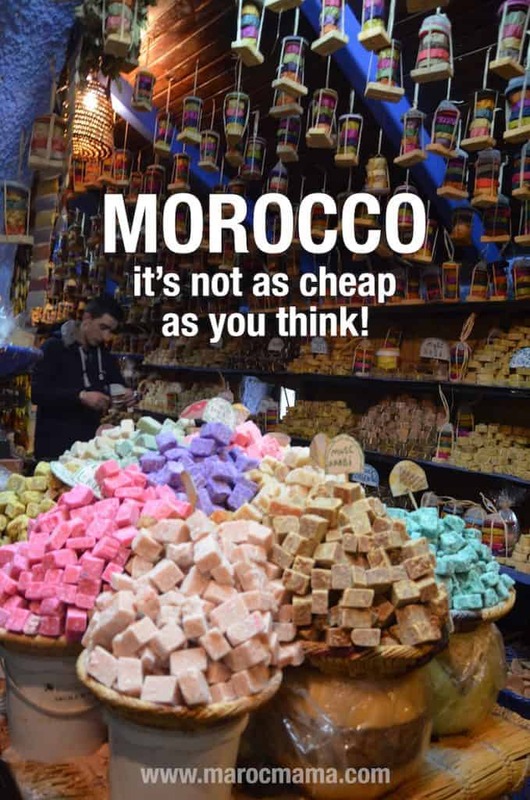 You’re right though, the price inflation shouldn’t deter you from traveling or moving to Morocco. It’s so so worth it. Adjustments can be made and things will work out. ? Thanks for the international financial perspective! All though I’ll be remaining in Wisconsin and dealing only with local prices for the foreseeable future, it’s good to know what people in other countries are dealing with money-wise. I hope all’s well with you and your family! It’s so nice to hear from you! We hope that you are all doing really well! I’ m not at all surprised by the quoted food and service prices and salaries in the blog post. The data are genuinely accurate. Morocco is paying the price of being a highly attractive country, with an increasingly international melting pot, who wants international living standards. In Casablanca average executives’ salaries are not too dissimilar to those in Southern Europe and France. A one-bedroom appartment in chic Gauthier or Anfa neighbourhoods in Casa and the like costs around 800 euros per month. Marrakech is gradually more and more moneyed “international jet-set” orientated with classy events such as Marrakech international film festival, Marrakech du Rire led by Moroccan French comedian Jamel Debbouze, international arts galleries exhibitions during the Marrakech Biennale etc. Imported goods are expensive, but I find electronics to be priced more or less the same as in Europe. It’s cheaper for me to buy electronics in Morocco than in the UK. The average Moroccans are really wondering how they will be coping with such higher living costs year on year. Thanks for the tips! I would love to visit Morocco soon, and will keep your advice in mind, plus check out your other articles. Along the lines of imports being expensive, are there any kinds of US products or brands that are particularly coveted by Moroccans? I’m visiting Morocco for the first time next spring for the wedding of my (American) son to a Casablancan woman. It will be (what I understand to be) a typical/traditional 3-day Casablancan celebration hosted by the bride’s parents, starting with the Henna party and ending with the marathon feasting/dancing/5-bridal-outfits party. Although the couple has been living together here in the US for 3 years and I’ve gotten quite close to my future D.I.L., this will be the first meeting of our 2 families and I want to introduce ourselves and show our appreciation for them and their daughter with appropriate groom’s family gifts. Getting input from my FDIL on this has proven to be harder than I thought– while Americans might view providing others with specific ideas of what they want and need (either verbally or via wedding registries and wish lists) as practical and helpful, I can see how this could viewed by less materialistic cultures as borderline insulting, which I think is why my FDIL seems always so reluctant to give me specific gift suggestions. Her response is always, “no no you don’t need to bring gifts!” This is despite the fact that both times she’s been back to Casablanca over the past 3 years, she’s returned to the US with suitcases crammed with gifts for us from her and her mother– Moroccan food items, French cheeses, ceramics, baskets, slippers, a tea set, a pair of (unstuffed) poufs, rugs, etc. So I guess my question is, since @marocmama wrote “Top Souvenirs to Take Home from Morocco” , can anyone suggest some “Top Imports or souvenirs to Take TO Morocco” ? Looking forward to future posts on both blogs! Oh this is tough!! I can tell you my female in-laws love to receive really nice brand name perfumes, body lotions, bath products and the like. While you can get it in Morocco there isn’t the selection and it can be VERY pricy. Soft, warm slippers and bathrobes also tend to be welcomed as again it’s a quality issue. I’m sure she won’t fess up to give you any ideas but bringing gifts would be a very welcome gesture. I might suggest just being really forward with the FDIL and saying look I’m bringing gifts so you have to help me! It might also be helpful for her to walk you through what to expect at the wedding as it’s quite different from the American experience. Have fun! !